There was once a time when TVUPlayer was indeed the very best of online p2p television that was available, but times change and it seems that TVUPlayer has fallen behind a little bit. In fact, the latest version we could obtain was released in 2010 and it's 2012 now. 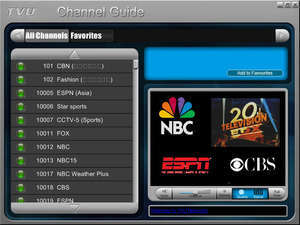 With that said, TVUNetworks offers their TVUPlayer product which allows you to watch television over the Internet. Several different types of channels are available and last we checked, we could access NBC Streaming, ABC Streaming and other network television programs which are normally available only by cable or satellite. Version 2.5.3.1 is a freeware program which does not have restrictions and it's free so it doesn't cost anything. For security reasons, you should also check out the TVUPlayer download at LO4D.com which includes virus and malware tests. Additional screenshots of this application download may be available, too. TVUPlayer has a presence on social networks.